Every year there is a day when my partner Jared comes down the stairs and notices that the dining room table has disappeared. “Ah,” he says, “Spring is coming and the seeds are back.” You see, I am what you might call a ‘Seedaholic.’ While preparing for gardening season the dinner table is covered by everything seedy – seed catalogues, seed cleaning tools, my home grown seeds for trading, seed envelopes, garden charts and more. New this year: tree info as we study which tree to invite into our family. Some of you, too, might be planning gardens and tree plantings. The environmental benefits of doing so are wide-reaching, but you might be wondering how to do so in a way that maximizes an already eco-friendly endeavour. In that spirit, I’ve put together a guide for sourcing both seeds and trees – ones that are good for our environment and help support the diversity of our plants. In the last century we have lost 75 per cent of our genetic diversity. Heirloom seed producers are reclaiming some of that loss. When buying seeds, I always start by reading catalogues and looking for local, open-pollinated, heirloom and organic seeds. These seeds have been grown without chemicals, are appropriate to the region and have been grown for decades, if not longer (heirloom or heritage). They are key to saving the diversity of our food sources. So, where can you find seeds? As Beach Metro gardening columnist Mary Fran McQuade recommended in the Feb. 20 issue, Seedy Saturdays are a great place to purchase seeds and learn from growers and gardeners. In March there are two that are accessible to East End Toronto – the first is on Sunday, March 18 at the Evergreen Brickworks and the second is on March 24 – the Scarborough Seedy Saturday and Green Fair, which I help coordinate, at 100 Brimley Rd. South (south of Kingston Road). At these events you will find many of the same seed producers noted in #1, but in person. Not only are Seedy Saturdays a great place to buy seeds, but if you have seeds saved then this is where you can exchange them. “Seed exchanges in the spring are often the first time people gather after a long winter to swap favourite varieties of seeds and learn gardening tips from each other,” said Teitle-Payne. There are more than 120 Seedy Saturdays across Canada. For a list of all Toronto locations go to www.torontourbangrowers.org. For a list of national ones go to www.seeds.ca. Did you know that there are Seed Libraries in Toronto? At these you can borrow seeds, plant them, grow them out for food (some for seed) and then bring your seeds back in the fall (kind of like returning books). These seeds are organic, open-pollinated vegetable, annual and perennial seeds. There is one located at the Tool Library on 1803 Danforth Ave. For more information visit www.torontoseedlibrary.org. I can’t wait to place a new tree in my backyard, but I am debating between putting in a food tree, a habitat friendly tree (oaks host the most), a habitat shelter tree (evergreen) or a big, beautiful red maple for fall colour. Luckily, there are many ways to source help and find trees to plant in Toronto – some free and some subsidized. All provide trees that are either native and/or are adapted to our growing conditions. Note that timing for some of these sources is key as some programs have deadlines coming up in the next few months or sooner. The City of Toronto will plant a tree for free on your front lawns (situated on the City allowance). You can order your tree through https://www.toronto.ca/services-payments/water-environment/trees/tree-planting/ (or call 311) but note that it can take six to 12 months to get your tree in place. Another source of free trees is through a community grant program from the Parks and Tree Foundation program Tree for Me (TFM). Last year, the Beaches Triangle Residents Association received a grant from TFM and planted over 50 trees. One of my favourite tree, shrub and native plant sources is local group TreeMobile. TreeMobile sells fruit trees, shrubs and vines at subsidized prices which helps bring down the cost. All profits go towards supporting urban orchards and community gardens (they provide funds to these through their Edible Garden Grant). TreeMobile has an amazing selection online – think specialty ones including Persimmons, Pawpaw, Russian Almond and Hazelnut, the latter of which is becoming the favourite to go in my garden. You need to order by early April for delivery in the Beach area by April. 29. You can either pick up your item or they will deliver and/or plant your selection for a nominal fee. Their products are excellent. 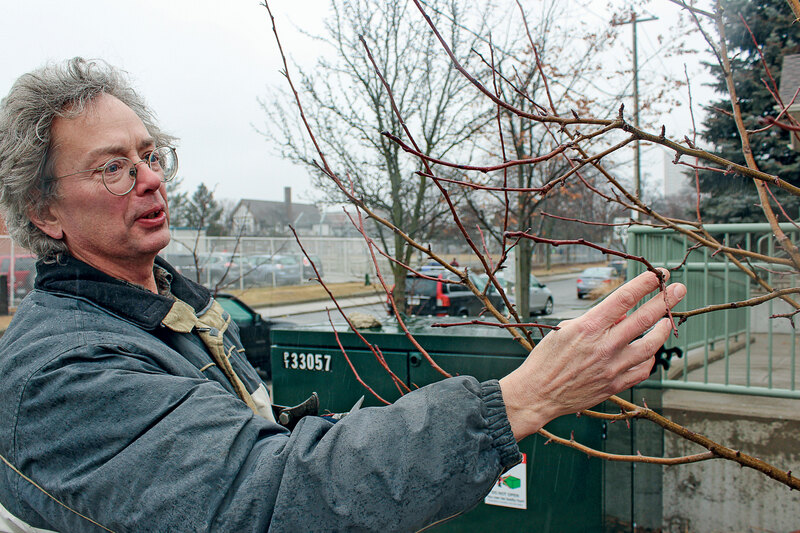 This well-respected organization has been helping residents plant trees for years. They have both a full service and do-it-yourself backyard tree planting program. The cost varies depending on your program but can include: consultation, siting, tree planting and some maintenance. They have a great selection of trees, shrubs and garden kits. These are the seed and tree sources from my favourite local producers and organizations. There are, of course, many more reputable nurseries and gardening supply stores throughout the area. So good hunting and happy gardening!